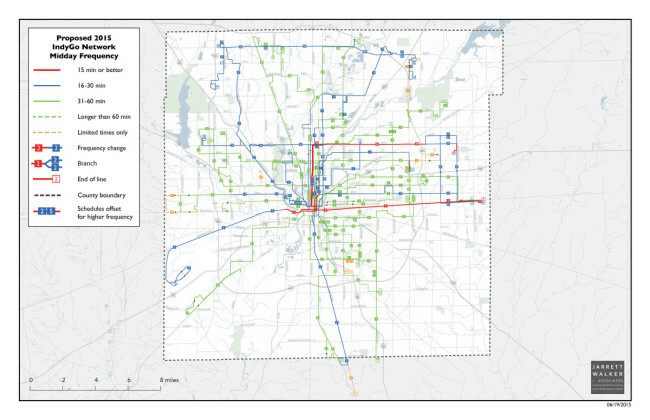 In 2014-15, Jarrett Walker + Associates led a Comprehensive Operational Analysis of the public transit network in Indianapolis. This was a joint project with the transit agency, IndyGo, and Indianapolis Metropolitan Planning Organization (MPO). The context included an unfunded long-range plan for several Bus Rapid Transit lines that would go to the voters in the next few years, and the need for a total transit network to present as part of that plan. Immediately, the network needed restructuring to accommodate a new downtown transit center. JWA led a series of staff workshops to develop the key elements of the plan in an interactive and inclusive way. A Stakeholder Advisory Committee was also engaged, as well as broader public outreach. Extensive discussion and preliminary decision on how to balance ridership goals and coverage goals. A revised plan for inner city bus routings, to prepare for the opening of a new transit center and for a transition to a higher-ridership network. This plan also included a range of other “low hanging fruit” improvements to consolidate routes and increase frequencies in the core network. Extensive discussions with staff and key decision makers on the evolving thinking around the Bus Rapid Transit Corridors. Six scenarios for 2021 for the full network based on a range of financial projections. An additional set of network scenarios for 2018 based on a revised Bus Rapid Transit plan. The plan has put the transit agency and MPO on track to handle a range of contingencies over the next few years, including a potential starter BRT project and a ballot measure for more expanded transit. It has also set the framework for more robust regional discussion about how to balance transit’s competing goals, and what those decisions mean for the future of the network.